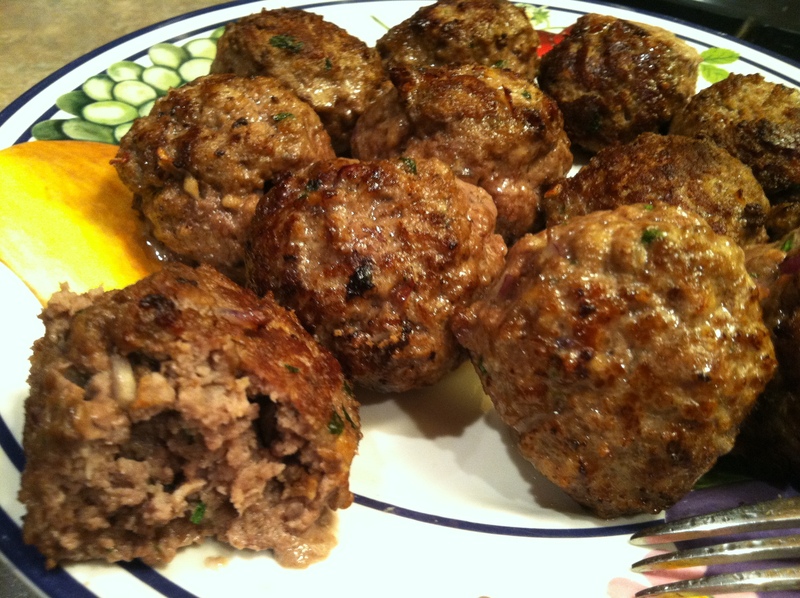 Meatballs – You will LOVE these! Every single one of us in this house love these meatballs. You can always cut this recipe in half. This recipe will make about 24 meatballs. Our family loves meatballs so cutting in half wouldn’t cut it here! Simple and Delicious! 1. In a bowl soak the bread in the milk. This is called a panade and is a very important step. This makes the meatballs moist and delish! 2. 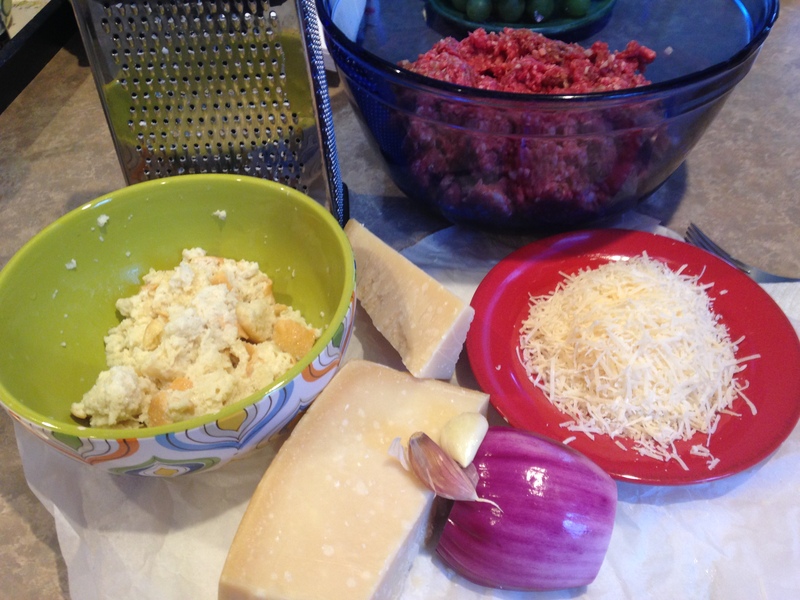 In a medium bowl, mix the ground beef, ground pork, bread and milk, onions, parsley, eggs, cheese, and garlic. Add salt and pepper to taste. 3. Form the mixture into 1-2 inch since balls. I like them about 2 inches. 4. Put olive oil in non stick skillet. 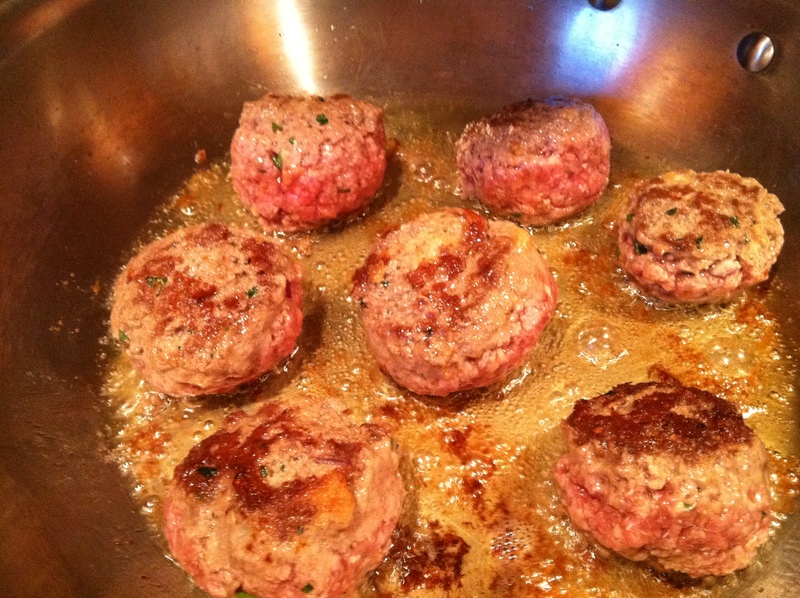 Fry meatballs over medium to medium high heat until browned on each side. When I make meatballs I usually am adding to a sauce to cook through. If you are going to make the meatballs and not add to a sauce, brown them in the skillet then transfer to a foil or parchment lined baking sheet. Place in a preheated 350 degree oven and bake for 10-15 minutes. You could also cook them through in the frying pan. I have done it both ways. I saw this recipe in an old Rachel Ray magazine I had been looking through over my morning coffee. These sounded too good to resist. I used ground pork cause that’s what I had in my freezer. Eric and Rachel popped over today and thought they were delish. Then Martin came home from a Chicago weekend and popped a few. He said, “Mom, I enjoy eating out at restaurants but your cooking beats them all!” I guess these meatballs pass in this home!! Canola oil, about 1 quart. You will need for sautéing and pan frying. 1. 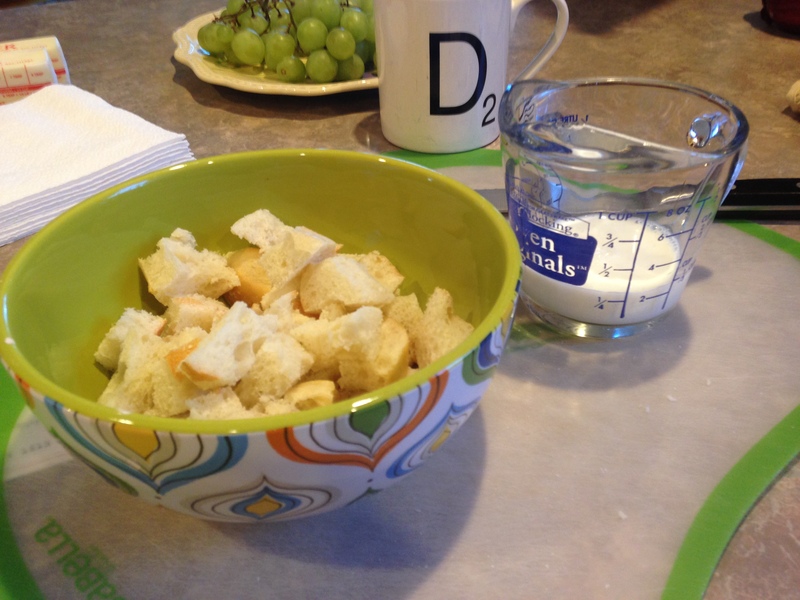 In a small bowl combine the bread and milk, set aside. 2. In a medium skillet heat 1 Tablespoon canola oil over medium heat. Add the onions, saute until translucent (about 3-4 minutes). Add garlic and stir frequently about 1-2 minutes. Set aside to cool. 3. In a larger bowl put the ground pork, egg, oregano, coriander, cumin, cinnamon, nutmeg, 1/2 teaspoon ground pepper, 1/2 teaspoon salt and cooled onion and garlic. Squeeze excess milk from bread. Place bread in bowl. Using hands, gently combine the meat mixture. Form into 20 small balls. 4. Place flour in a medium bowl. 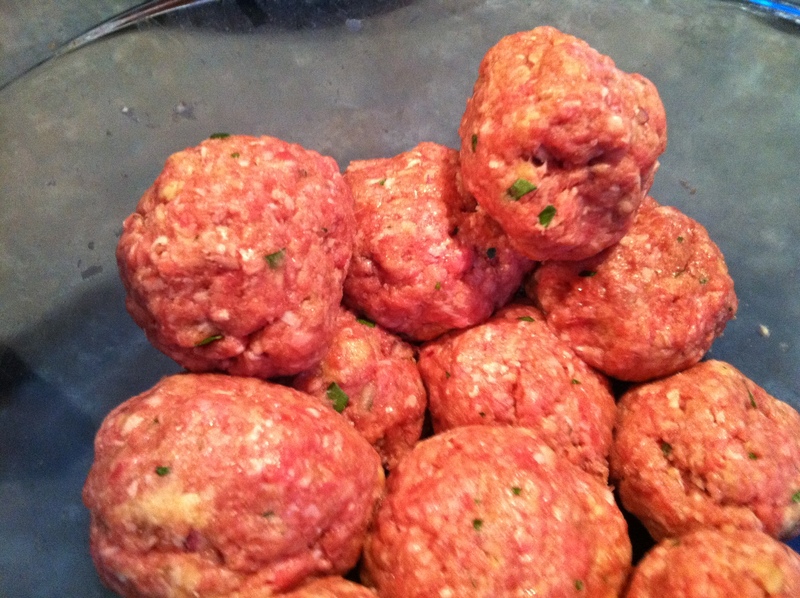 Roll the meatballs in the flour, shaking off any excess. Place on plate. 5. In a large non stick skillet, heat 1/3 inch canola oil over medium heat. Add the meatballs and cook on each side 3-4 minutes. (I slightly flattened when I was placing in the skillet.) Transfer to paper towel lined plate. I hope you give these a try. They take no time at all and are incredibly flavorful. ENJOY!